Last winter, most of the Northeast corridor experienced their second consecutive winter with frequent strong nor’easters, heavy snowfalls, and well above normal snowfall totals for the season. I employed solar activity for the first time, as a basis for my NAO forecast, a factor highly important in terms of sensible weather in both the United States and Western Europe. The results were good; the NAO averaged negative (actually very negative) in response to the unprecedented geomagnetic minimum we entered a few years ago. The tropospheric response to the onset of the geomagnetic minimum, with extreme blocking in the northern hemispheric winter, took about 1-1.5 years, which is fairly typical for the NAO-geomagnetic correlation. The question now becomes – does the upcoming winter feature a similar level of north Atlantic blocking to the past couple winters? There are some different external drivers on the playing field this winter, which will be examined. The final outlook for the US, specifically the NYC area and the Northeast, will utilize such variables as analogs, tropical forcing, statistical correlations, solar forcing, pattern persistence, and ENSO climatology, among others. Solar cycle 24 has proven to be the weakest in centuries, with sunspot numbers comparable to both the Dalton and Maunder minima. 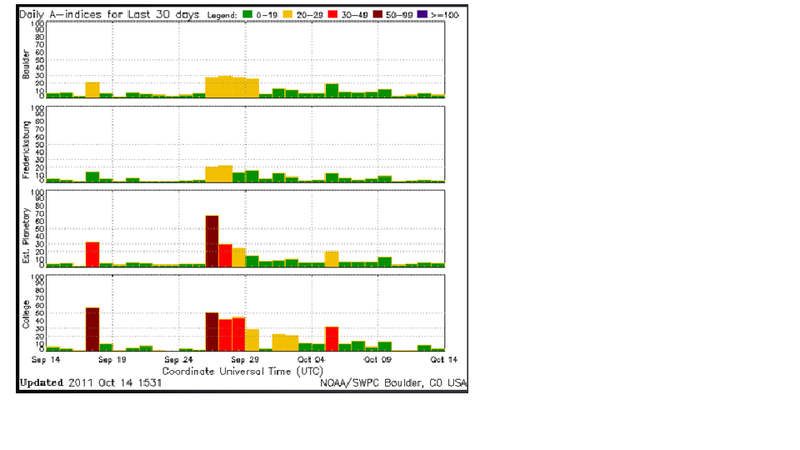 Sunspot number has increased over the past year; however, the Sun’s geomagnetic field remains very quiet. This disconnect could very well suggest that sunspot number will not rise much more than we’re seeing currently. Many forecasts for solar cycle 24 have been revised to portray a much weaker cycle overall. 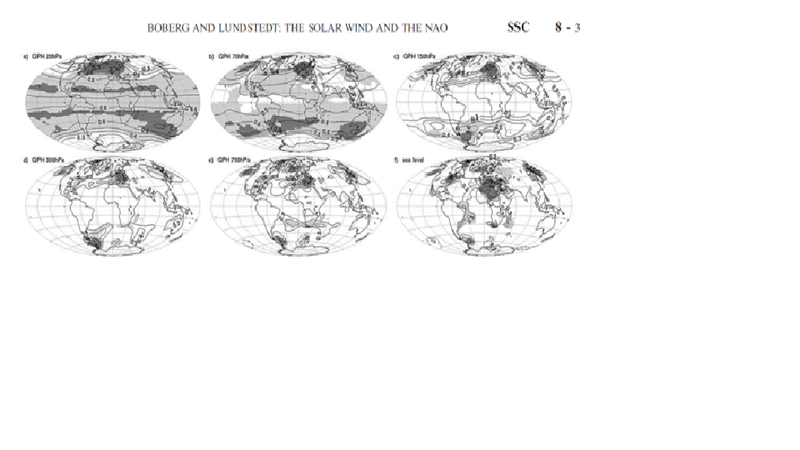 In a paper by Boberg and Lunstedt, 2003, they discussed the solar wind electric field modulation of the NAO. Their findings were quite fascinating. For brief background, the solar wind is essentially a stream of charged particles ejected from the Sun’s atmosphere; these particles carry protons and electrons through space, and sometimes when conditions are favorable, can enter Earth’s magnetosphere and ionosphere. The electric field strength of the solar wind is depicted by “E”, the first panel in the graph above. If one compares that to the second panel, depicting NAO data from 1974 to 2001, one can see a fairly impressive correlation between the two variables. In their study, the linear correlation between the “E” index and the NAO was found to be 0.65. However, it is worth noting that the solar-NAO connection is significantly more pronounced in the winter months, November-March. This is likely because the interaction between Earth’s atmospheric layers – ionosphere down to the stratosphere and finally troposphere – is more pronounced during this time frame. The correlation between “E index” and the atmospheric pressure at various levels, from 20 hPa to sea level , was examined. The results were a fairly evenly distributed correlation of about 0.6 to 0.7 around 20N and 20S, from the upper stratosphere down to sea level. Thus, the NAO appeared to be affected quite significantly by the solar wind during the winter months, via downward propagating circulations. 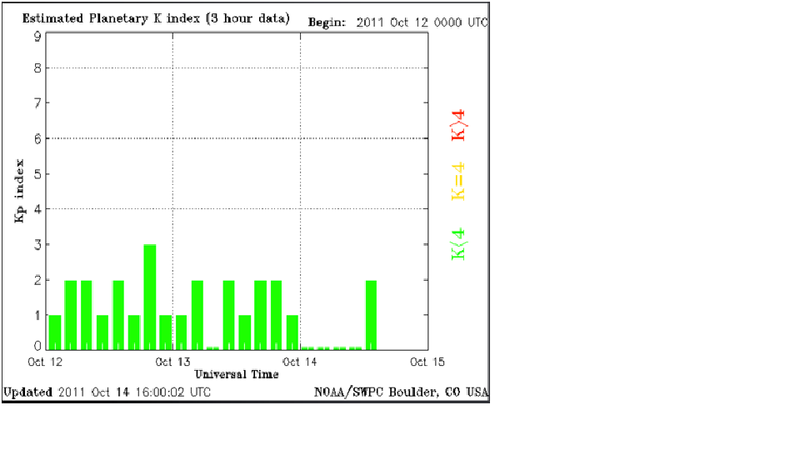 The geomagnetic indicators continue to remain weak this autumn. The Kp index has been hovering between 1-2, and the ap index has generally been between 3-7. Values lower than 3 for the Kp index and values lower than 10 for the ap index are considered to be weak/very weak. When we couple the weaker than normal electric field strength of the solar wind, quiet geomagnetic activity (Kp, ap indices, etc) we end up with an atmosphere that continues to favor the development of positive height anomalies in the north atlantic. The Southern Hemispheric winter featured a strongly negative AAO (basically our version of the AO) possibly foretelling the northern hemispheric pressure pattern. Given that the entire Earth has been subjected to very low levels of solar, geomagnetic activity, it is not unreasonable to suggest that a similar pattern will occur in the northern hemispheric winter as we saw in the southern hemisphere the past several months (that is, a regime conducive for strong blocking). Last winter saw extreme blocking in the face of a strong La Nina and +QBO, both unfavorable conditions for the presence of blocks. However, the weakened geomagnetic environment was sufficient to override said factors. La Nina will not be a strong this upcoming winter, but the solar pattern is not as impressive as it was last autumn (not as weak). Regardless, the solar regime going into this winter will be more than enough to promote a predominately negative north atlantic oscillation (NAO). Since there is a high statistical correlation between the NAO and AO, I also anticipate a negative AO. Another factor to examine is the autumn NAO pattern, that is, the index’s modality in the months of September and October. Positive values correlate well (about 0.65-0.7) to a negative NAO winter, and vice versa. 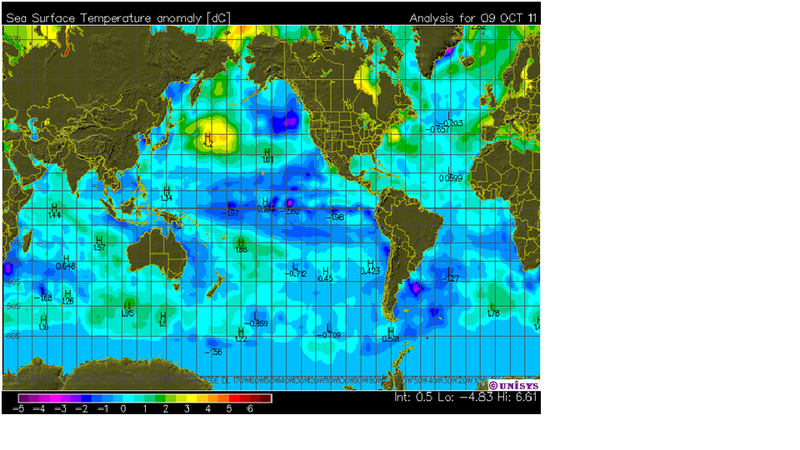 This autumn has featured a slightly positive NAO thus far, and the remainder of October looks to be neutral to slightly positive. The AO has seen similar values. In turn, this strengthens my argument for the third consecutive negative NAO/AO winter, one which should feature at least one month of strongly negative NAO/AO values. 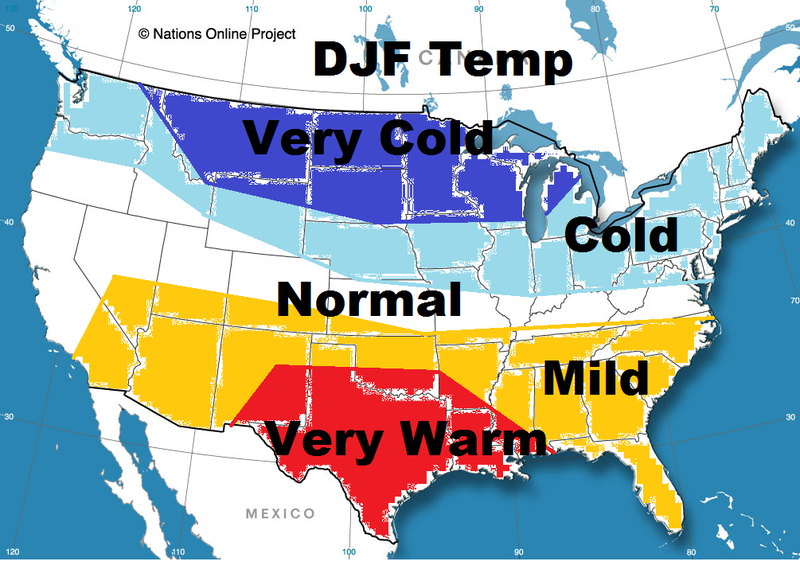 My confidence is high on a winter average, DJFM, moderately negative NAO/AO. Given this expectation, it significantly aids my sensible temp outlook for the United States. Given that the Pacific Ocean covers a large percentage of the world, it’s not surprising that its oceanic patterns need to be examined for a long range outlook. Last winter featured a strong La Nina event; what about this year? Latest data suggests ENSO region 3.4 has fallen to -0.78c, a value within the “weak La Nina” classification. 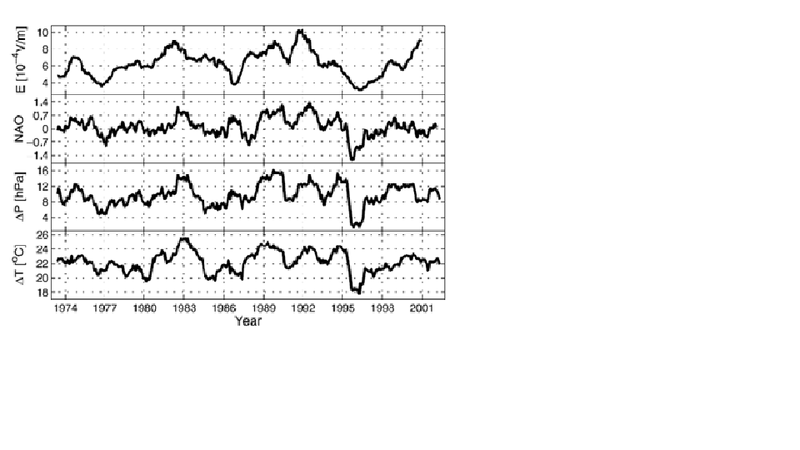 Looking back over the past 60 years, if we were to have a strong La Nina, ENSO region 3.4 should already be < -1.0c. The probability of the current event strengthening into a strong La Nina is very low, given the current readings, the fact that this is a second year event (second year La Nina’s are almost always weaker in intensity than the first year), and climate forecast models. ENSO forecast models are somewhat in disagreement on the peak intensity of the ensuing event. The CFS projects a strong La Nina, the European projects a low-end moderate La Nina, and most statistical models indicate a peak anywhere from -0.7c to -1.2c. Given the fact that we are already near -0.8c in region 3.4, and most Nina’s peak in the Nov-Dec time frame, I anticipate a peak around -1.0c to -1.3c, which is within the “moderate” strength criteria. In almost all cases, summers that featured moderately to strongly negative PDO’s also had a negative PDO during the winter. Similar to the high correlation between the NAO and AO, the PDO is also correlated highly to Pacific North American Index (PNA) values. Winters with moderate La Nina’s and negative PDO’s virtually always mean the PNA will be mainly negative as well. There may be transient periods of positive values; however, the winter, DJFM, should be negative. Below is the current SSTA map of the world. One can see the negative (blues) in the eastern and tropical Pacific, indicating the presence of the negative PDO and La Nina. In the Atlantic, we see a much warmer SSTA regime, suggesting that the Atlantic Multidecadal Oscillation (AMO) is warm/positive. This should persist through the winter, making this year quite similar to many winters in the 1950s. The decade of the 1950s had a predominately negative PDO/positive AMO regime, similar to the present. Furthermore, the decadal NAO cycle was heading negative as it is now. 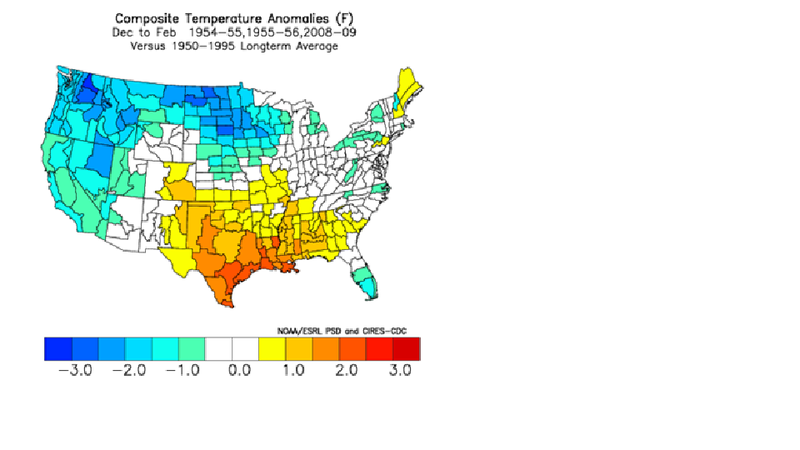 Thus, one will note that most of my analogs for this winter are from that time period. Yet another factor to throw into the mix is tropical forcing, which has been shown to have distinct, fairly predictable impacts on downstream height anomalies, making it a viable tool for long term outlooks. The Madden-Julian Oscillation (MJO) propagates through 8 octants (suitable name), each phase producing a certain pattern across the United States, depending upon the time of year. For example, a phase 2 MJO could mean a cold pattern in the Northeast in one month, yet that same phase could mean warmth in another month. The MJO will be progressing through phases 1-2 over the next two weeks, which at this time of year, promotes large scale troughiness in the Eastern US. The pattern will also turn quite a bit wetter in the next couple weeks, as the MJO also has effects on precipitation anomalies. As the wave of upward motion propagates W-E over our longitude, both temp and precip patterns are impacted. As an example, below are the temperature composites for the various phases of the MJO, centered on the month of October. The dominant factors at play for the winter of 2011-12 should be a weak geomagnetic field, weak electric field strength of the solar wind, a negative NAO, AO, PNA, PDO, and ENSO (moderate La Nina). In addition, a factor not mentioned in the discussion is the QBO, which measures variations in the equatorial stratospheric wind, will be near neutral to slightly negative. Data for winters with this modality in conjunction with the solar external forcing noted already support negative NAO winters with plentiful blocking. Notice that all the indices mentioned above will be in a negative state, suggesting that the middle latitudes of the northern hemisphere are in for a colder than normal winter overall. However, that does not mean everyone will be cold. Notable pockets of warmer than normal temperature departures will exist this winter, one such location over much of the Southern United States. 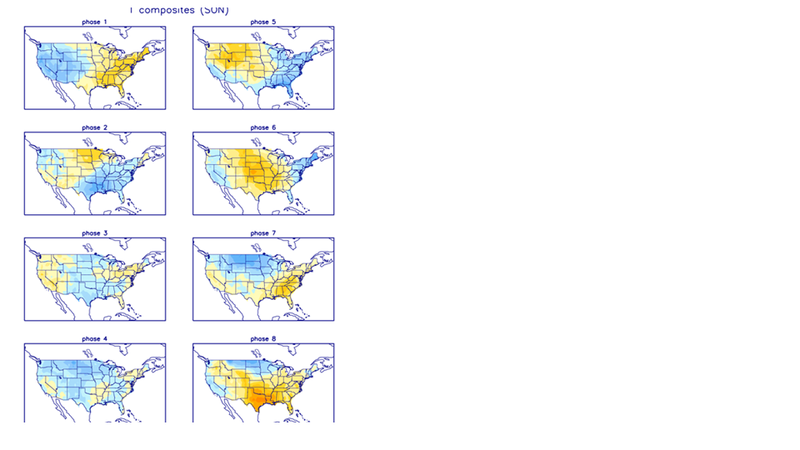 Coupling the conditions expected with analogs (years with similar regimes to this one) suggest an overall warm winter (DJF) from the Southwestern US eastward through the central/southern Plains, and the Southeastern US. The DJF departure map for the Northeast of slightly below average temperatures is a bit deceiving, as I believe there will be periods of extreme cold and extreme warmth spattering the winter in the Northeast. The northern Rockies into the Mid-western US and Great Lakes should have a more predominately colder than average winter. My analogs for this winter: 1954-55, 1955-56, and 2008-09. Looking at the winter more closely, I believe the front part of the winter will feature the coldest temperatures relative to normal in the Eastern US. 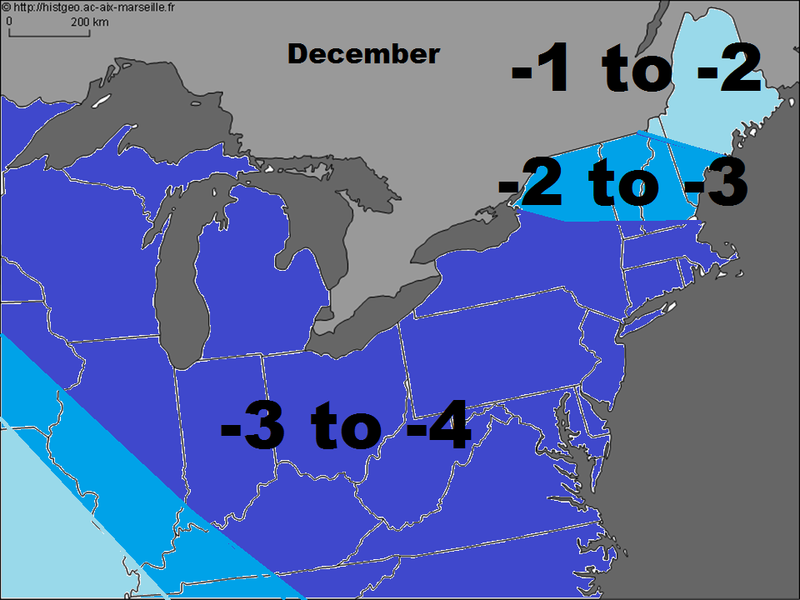 December 1st-January 10th should feature generally colder than normal temperatures in the Northeast. 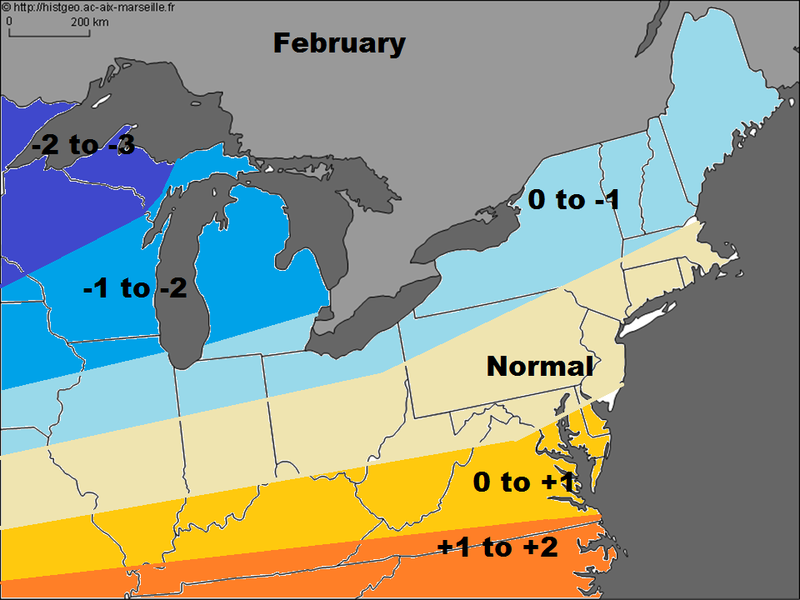 Expect a thaw to occur from about January 10th to January 25th with warmer than normal temperatures in the East. Then winter will return with another bout of cold temperatures in the East from near the end of January through the middle of February, followed by rapid, strong warming for the second half of February. I believe the time frames most favorable for significant Northeast/Mid-Atlantic snowstorms are the December 15th-23rd period and the January 25th-February 10th period, +/- 5 days or so. 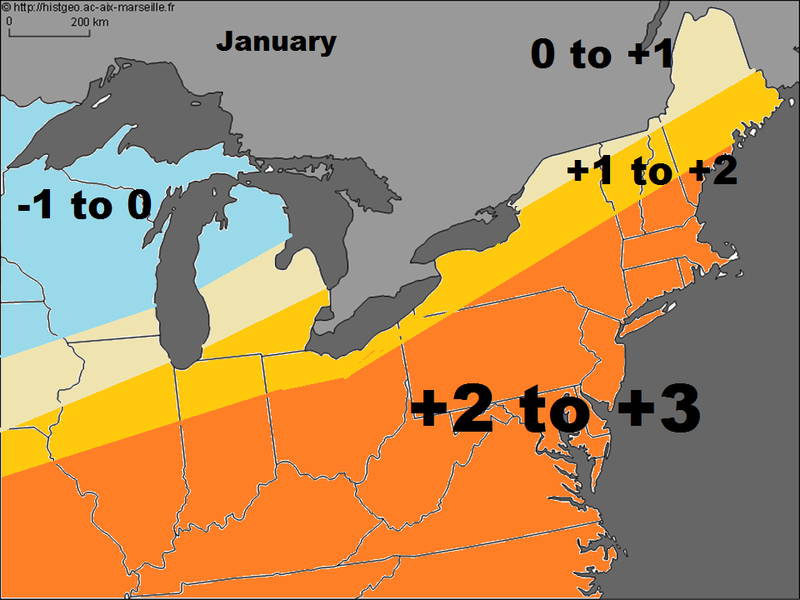 The most wintry part of the season for the Northeast/East should be the 40 day period Dec 1st through January 10th, although other notable winter events are possible late January through early February for the I-95 corridor. 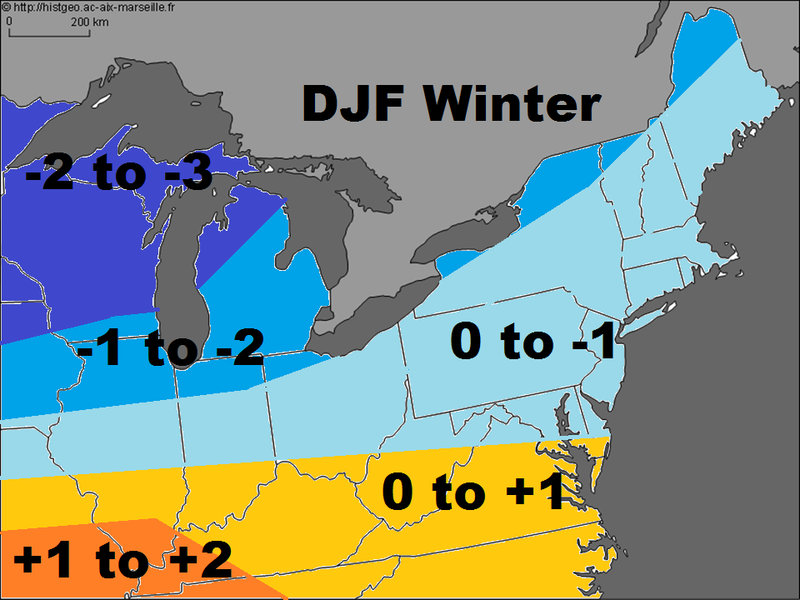 The interior Northeast, most of New England, and the Great Lakes should have snow events spattered throughout the entire DJF period. This is where the greatest snowfall totals with respect to normal should occur – the lower Lakes into the interior Northeast. With that said, the I-95 corridor from RIC to BOS will also see above normal snowfall in conjunction with slightly colder than normal temps for the winter season. *Keep in mind snowfall has the least predictability of any other factor in the long range.